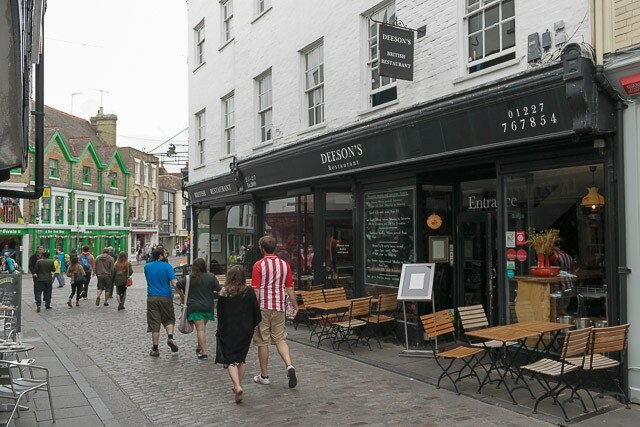 Claire and I love Canterbury, so when we had a chance to visit, we had to booked a Sunday lunch there too! 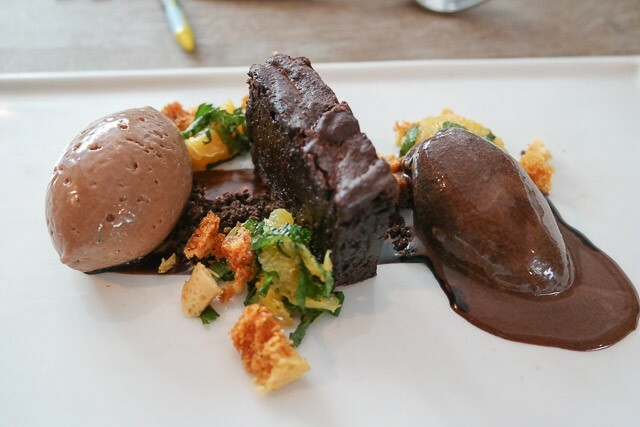 We previously reviewed the Sunday lunch at Abode Hotel on the High Street, this time I decided on Deesons. We were met at the bar and shown our table around the other side of the restaurant. It was all set up for us, with linen napkins. Our section had dark wallpaper on the wall, with colourful butterflies. We had a shop front window letting lots of light in. Claire ordered an English sparkling rose, I ordered a becks lager, along with some sparkling water for the table. 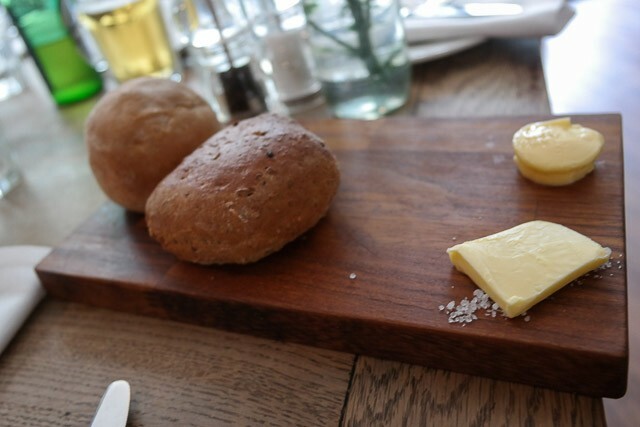 We skipped starters – some bread was brought out with smoked and normal butter. The rolls, being freshly baked, were nice and hot. Claire and I both ordered a roast beef. We ordered JW (our toddler) a roast chicken gluten/dairy free (we were told he couldn’t have the gravy nor stuffing). It was a bit of a wait for our food and then JW’s came out with stuffing and gravy (definitely not gluten/dairy free). So, they took it away to serve again. We couldn’t start to eat until his food came out which took quite a while, so our food got a bit cold! I had two slices of pink beef, a large Yorkshire, two roast potatoes, greens, carrots, parsnips, broccoli along with gravy. Claire didn’t like the gravy or beef, but I enjoyed both. Oh, and JW’s now came with gravy, and were assured it was ok. The roast potatoes were good, as were the fresh carrots and parsnips. 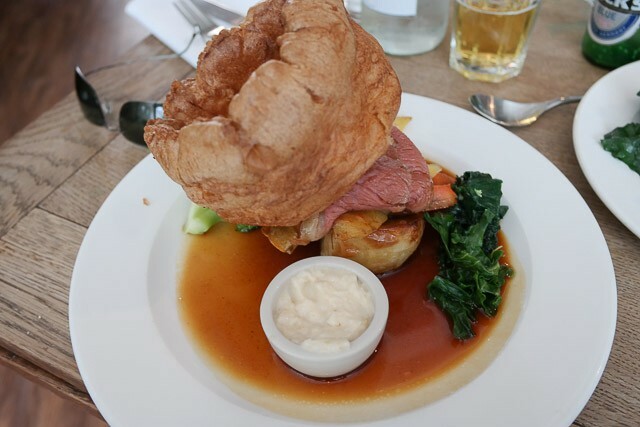 The Yorkshire pudding had a light texture and was enjoyable. 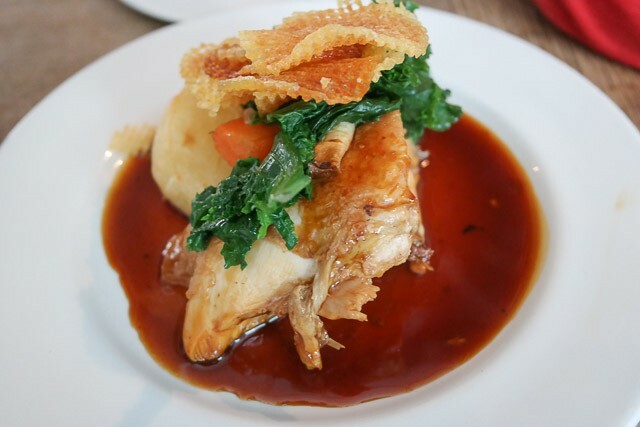 JW had large chucks of chicken, one roast potato and vegetables, including parsnip crisps on top. He enjoyed it, although could have done with more potatoes. I ordered the pear and sticky toffee pudding, Claire asked for the Trio of Chocolate dessert. Served quite quickly, Claire’s dessert was good, especially the fresh mint salad – the plate was very warm (from a dishwasher? ), which meant some the dessert was melted. 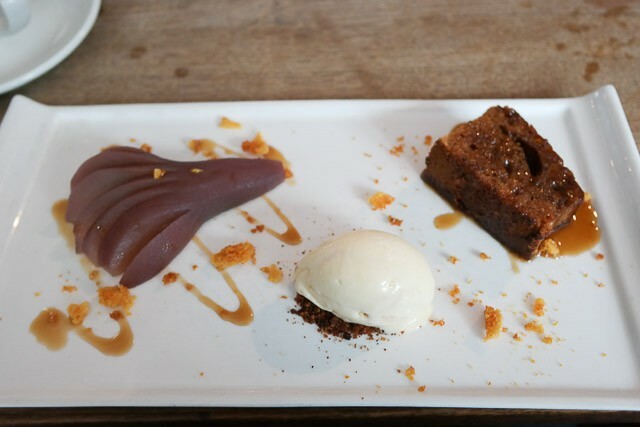 My pear and sticky toffee was as good, the contrasting texture worked well together. They provided a clean and sturdy high chair. We didn’t need to use a baby changing facility, so couldn’t comment on that. They offered a small child’s roast, so this worked for us. A mixed bag here. A nice lunch which was very difficult at points with regards dietary requirements (gluten, wheat and dairy free). “Which sorbets can he have?” “All of them, including the ice-cream such as yoghurt and clotted cream”. Obviously very wrong, and it made us question the rest of his dessert. Also, bringing out the main meal with stuffing was also wrong, as well as incorrect info about the gravy – oh, and no recompense with waiting for JW’s food and ours getting cold (or asking if they can serve ours again with JW’s). The service, apart from this, was attentive and the venue itself was nice. Our mains, although colder than they should have been, were mostly enjoyable If we didn’t have the issue with the dietary requirements, they would probably have received a higher score. As it stands though, some of the mistakes were quite fundamental, so it’s an average 3 /5 – but could have been 4+. Worth a visit, but really do not go to Deesons if you have any food allergies.